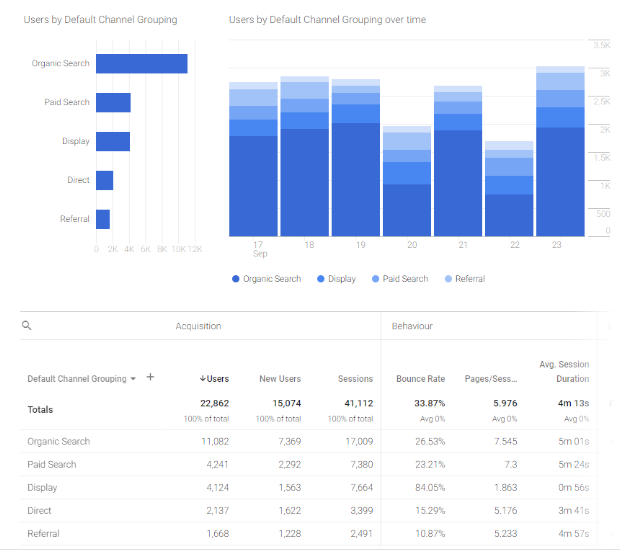 Home » Blog » Google Signals in Analytics – what is it and should you do it? When you activate Google Signals, existing Google Analytics features are upgraded to include more information from Google users, but only for those who have turned on Ads Personalization. Does Google Signals and Ads Personalization affect GDPR? No data for individual users is ever exposed, it only reports in aggregate, so there are no GDPR issues. The retention of data is limited to 26 months, unless you have set your data retention setting to less, in which case that is respected. What happens when you click “Get started”? This refers to the Account level of Google Analytics. As long as all the properties are for the same company, there shouldn’t be an issue with enabling for all, but if you are an agency that has other companies’ data in your account, you may have to be more specific with this setting. You will need to have admin access to the account level (or you’ll get “Access denied”) in order to set this. If you don’t have account level access, you will be able to set it for the properties for which you do have admin access. 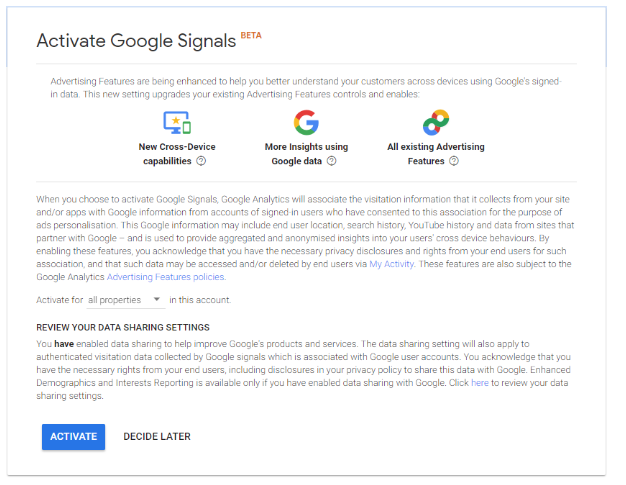 If you have not enabled Data Sharing in your Google Analytics account, you will see a different second paragraph asking you to turn this on, as Google Signals only works if you have this enabled. Google also asks you to make sure you are letting your users know. 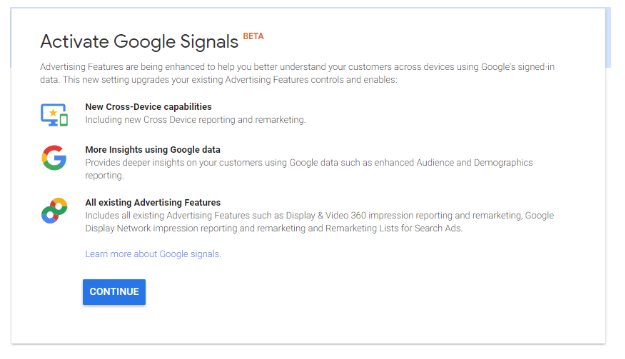 When should you turn on Google Signals? 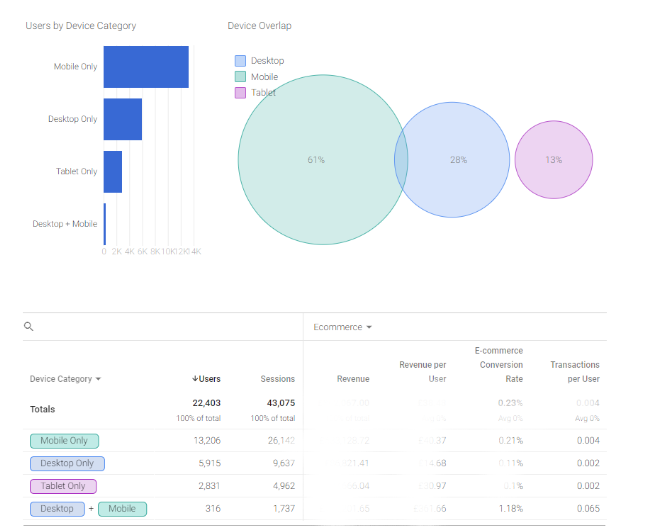 Like much Google Analytics data, collection of the information only starts from when you activate the information, so if you want to make use of it, you should activate it as soon as possible. If you are doing remarketing or using the behaviour reports already, this is a no-brainer. Is Google Signals useful for SEO? However, there doesn’t appear to be any cross-device information in that report that we can see. Perhaps there’s more to come, as the product is a beta, after all. 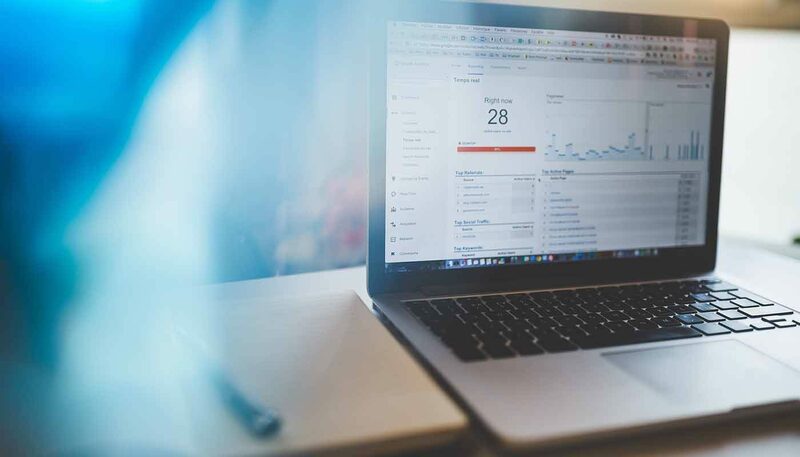 If you need help with anything covered in this article, don’t hesitate to get in touch with our Google Analytics specialists. At the eCommerce Expo this year I’m doing a talk called “Google Analytics – much more than a reporting tool” to provide some takeaway actions that professionals in eCommerce can put into practice straight away.